Spring Cleaning—I sorta dread it. Once the first warm spell hits,however, I want to open my windows and it begins the process of cleaning the house and finally ridding it of winter germs and cold month entrapment. Here are Spring Clean must-dos and even some areas you might not think to clean! Do you spend a lot of time in your car each day? Your commute feels so much better if your car is clean! And if you’ve got kids in there every day… oh man. Here’s how to get it feeling like new. 1. Pull everything out of the car. 2. Decide what you really need in there, what can be thrown away, and what can be stored somewhere else. 3. Vacuum the whole car. 4. Wash the inside windows by make a solution that consists of 2 cups of water, 1/4 cup of white distilled vinegar, and up to 1/2 teaspoon of liquid soap or detergent. Mix it in a spray bottle and use it to wash the windows with a rag or newspaper. Now you have a nontoxic, nonstreak formula to keep your windows crystal clear. Then dry them using a dry rag or newspaper. 5. Wash the dashboard and doors with the same solution you made for the windows. It removes grease and eliminates odors. 6. Grab a bucket and fill it with warm water and a cup of dishwasher detergent. For extra grimy cars, add a 1/2 cup of powdered laundry detergent. 7. Hose the outside of the car down and, starting at the top, soap it up. Once your car is all sudsy, hose it down top to bottom. 8. To dry it off, pull out your car chamois. Soak it, wring it out, and then lay it flat on the surface you want to dry. Grab a hold of the two corners closest to you and start to pull them toward you, this will ensure that you won’t leave streaks. When it gets soaked, wring it out again and repeat the process. Our refrigerators can be symbolic of how our lives look when we get too busy. Piled up food, stinky odors, and stained shelves are no way to treat a fridge—or a life. Don’t just give your refrigerator a good spring cleaning; you should clear it out every few months. 1. Start by cleaning the outside of your refrigerator. Remove all pictures, magnets, and other decorative items before you do. Then, mix together warm water and dish soap and wipe down the outside. If you have a stainless steel fridge, make sure to go in the same direction of the natural grain of the steel. 2. Then, move to the inside. Toss all of the expired products and foods, and put food containers in the sink or dishwasher. Put any remaining items in the cooler for safekeeping while you clean the shelves. 3. To clean the shelves, combine equal parts white vinegar and warm tap water. This is a nontoxic way to kill germs, clean stains, and remove odors. Using a sponge, wipe down the shelves, refrigerator walls, and all nooks and crannies in the fridge with this solution. 4. To help minimize odors, place a box of baking soda in the back corner of both the freezer and refrigerator. Just how long has that can of beans been sitting in your pantry? Clean your pantry to make room for new products and to take inventory of what you have. 1. Empty out the contents of your pantry onto the kitchen counter. 2. Check all the expiration dates and decide what must be laid to rest in the trashcan. Also check all spices, flours, and other raw ingredients for critters. Place all raw ingredients in sealed containers and label if necessary. 3. If you have new food restrictions, set aside anything unopened that you may want to have other family members eat, give to friends, or donate to charity. 4. Mix together equal parts white vinegar and warm water and wipe the shelves and cupboard doors down. Rinse with warm water, and dry the shelves and doors. 5. Place your baking soda boxes in the back throughout the pantry to eliminate odors. 6. As you place items back in the pantry, organize them according to: snack food, breakfast food, baking goods, grains, seasonings, and so on. It’s time to declutter your closet! People tend to wear 20 percent of their wardrobe 80 percent of the time. That means that more than half of the clothes in your closet are taking up space. While some clothes may be used for special events only (suits, evening dresses, jerseys, etc. ), I’ll bet that other clothes either don’t fit or don’t reflect your current style. 1. Pull all of your clothes out of the closet and lay them on the bed, dressers, etc. Empty the closet of all other items you have stored in the closet. 3. Wipe down the walls and shelves using an equal mixture of white vinegar and warm water (you may have noticed this solution is good for cleaning almost everything). Rinse with warm water, and dry down with a clean cloth. 4. Install anything that may help you further organize your closet throughout the year. This could include additional shelves, corkboards on which to pin jewelry or small items, a hat holder, a shoe organizer, and so on. ● Have I worn it in a year? ● Do I feel good when I wear it? ● Am I waiting for it to come back in style? ● Does it give off the impression I want to make? 6. Who could use this more than me? I did a HUGE purge and organization of my closet back in January, but now its time to clean out the spring/summer things. Is your computer slowing you down? A spring cleaning of your disk space can really speed up your experience on the computer. 1. Begin by uninstalling any programs you no longer use and remove applications you don’t use from the dock, or access your startup wizard so that only the programs you want automatically open when you start your computer. 2. Uninstall, delete, or store in a folder any applications you don’t use anymore, like the game your child used to play but hasn’t touched in a year. 3. Transfer your pictures and music files to an external hard drive to free up a ton of space and help your computer to run faster. Plus, if your computer ever crashes, you won’t lose these files. Or use Amazon Photo or Google Photo. Either way, back those precious memories up. 4. Organize your bookmarks into folders and delete any that go to pages that no longer exist. Then, clear your cookies and history. When we clean out our world, we leave room for our lives to change. We are no longer weighed down with the objects from the past and make space for the new, both emotionally and physically speaking. Hopefully, after this your world is a little nicer and cleaner, and you have the power and freedom to choose what comes into your new world from here on out. 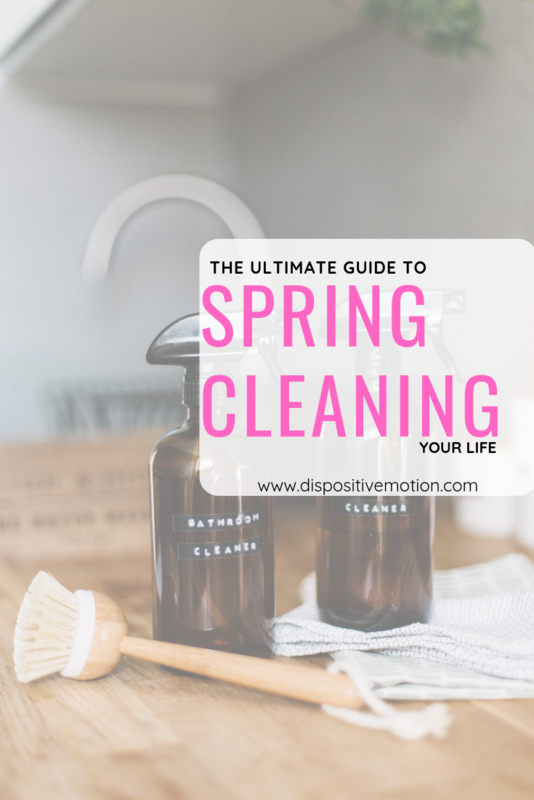 So, will you be doing a little spring cleaning this year? What places and spaces do you hope to tackle?